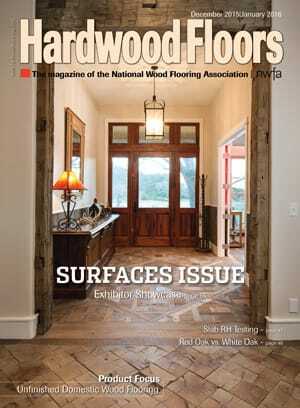 As published in Hardwood Floors, The magazine of the National Wood Flooring Association. Consider Greg Schenck a master tailor. The longtime owner of Houston-based Schenck and Company has the ability to design floors that weave together his client’s style with the character of the home’s surroundings. 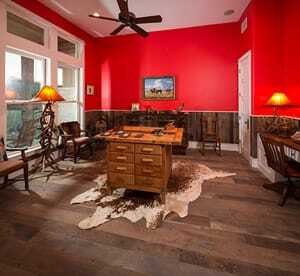 The talent recently won him an award from the American Society of Interior Designers Texas Gulf Coast Chapter. The award, his fifth in as many years, was for a wood floor design that entwined the rugged landscape of the homeowners’ 275-acre ranch in Texas Hill Country with their love for antiques and nostalgia. Hill Country is known for its Texas live oak, a hardy species of white oak that thrives in dry climates. The wood is tough to work with and the scourge of the state’s saw blades, so Schenck went with an easier-to-handle species of white oak for the floors in the home—a compromise necessary to stay sane. He chose a wide-width, long-length white oak reclaimed from barn beams and milled in Virginia. The boards have character—saw marks, weathered patina, knots. Schenck wanted them to look old, like they had been in a feed store for a long time, he says. In a feed store the “floors never stay perfectly flat,” Schenck says. “Some areas cup, some crown… the edges don’t stay square.” As a reference point, it was the perfect inspiration for a client with horses and a penchant for nostalgia. The floor was lightly buffed. “The goal is to be able to walk across it in sock or stocking feet and not snag on a splinter, but beyond that preserve as much character as possible,” he says. While the majority of the home features 6-inch-wide planks, Scheck installed wider random-width planks in the high-ceilinged family room. The inconsistency of the mixed widths, combined with the size of the room, amplifies the space’s folksy comfort. The best example of the home’s juxtaposition of grandiosity and hominess is in the entryway. Schenck took the same feed-store-inspired white oak and used it to install a Versailles pattern, which originated in the hallways of King Louis XIV’s palace. The Versailles pattern and family room is divided with another homage to the area—an end grain floor made of old hand-hewn beams that had been in centuries-old structures and weathered by Mother Nature through the years, Schenck says. 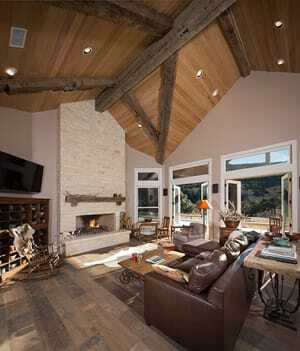 The beams look like they came from an old post-and-beam barn on a Texas ranch, just what the homeowners wanted. The center end grain block proudly displays two tenon pockets, hinting at its structural history. The beams are used throughout the home’s interior. They frame the family room and outdoor patio ceilings, like the timber-framed homes German immigrants built when they first arrived in Hill Country in the 1800s. The roughness of the beams is put into sharp contrast by the smooth ceiling panels made of cypress, a species that grows along a creek that runs through the property. The limestone used for the fireplace in the family room and around the exterior of the home is also native—the hills of Hill Country are limestone and granite, and boulders from each rock type dot the landscape. With his choice and juxtaposition of materials, Schenck created a design that was unique while fitting perfectly into its Hill Country setting. Hill Country made its way into the home in other ways, too. The area teems with wildlife, and the home’s interior design reflects that life. Deer antlers are everywhere in the home: on the beam mantle over the fireplace, in the stands for a floor and table lamp in the study, and mounted on a wooden block atop an antique workbench. Dozens of antlers are jumbled together inside a copper basin in the family room. The antlers were collected by the homeowners during walks in the area. Their use throughout the house speaks to the abundance of white-tailed deer in Hill Country, home to the largest population of the species in Texas. The homeowners care for many animals on the ranch, and their fondness for them makes its way inside via the home décor. On the mantle next to the antlers are two porcelain chickens. 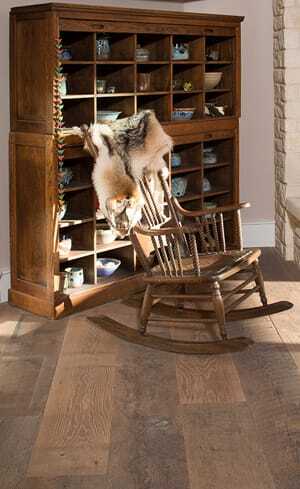 Animal skins drape over wooden rocking chairs and are splayed out across the reclaimed wood floors. As horses graze behind the home, an old saddle sits on a sawhorse in the corner of the study. Three paintings above the headboard in the master bedroom depict bird nests. Porcelain cats sit on the bedside table in the guest room. “On the ranch, the homeowner is there to celebrate wildlife,” Schenck says. The animal theme gives the feeling that the home is in a world of its own, far away from the bustling cities of Austin and San Antonio that define the gateways into Hill Country. The home’s reclusive charm is reinforced by the plethora of antiques displayed inside. The homeowners are dedicated collectors of nostalgia. Over the years, whether at Texas’s world-famous biannual Round Top Antiques Fair or through their personal antique dealer, they have amassed enough antique furnishings and fixtures that they did not need to purchase anything when they moved and filled in the new home. The husband’s favorite antique is a maple woodworker’s bench from an old high school, he says. It has dog holes on its surface, a metal vice and drawers to store tools and supplies. It was refinished and put in the middle of the study. His father used to be a high school shop teacher, so it brings back memories of the past. Planning for the home began in the summer of 2012, and the homeowners were given the keys in December 2013. Two years later, they are still thrilled with the look and feel of their home. “It’s the look that’s comfortable for me. It’s nostalgic for me. It brings back good memories,” the husband says.